Glasgow’s got so much going on it’d be impossible to do it all in two days! Having said that, we understand that our guests often have limited time off from their busy lives to enjoy our city, so we wanted to give you a flavour of what’s possible if you’ve got just 48 hours with us. 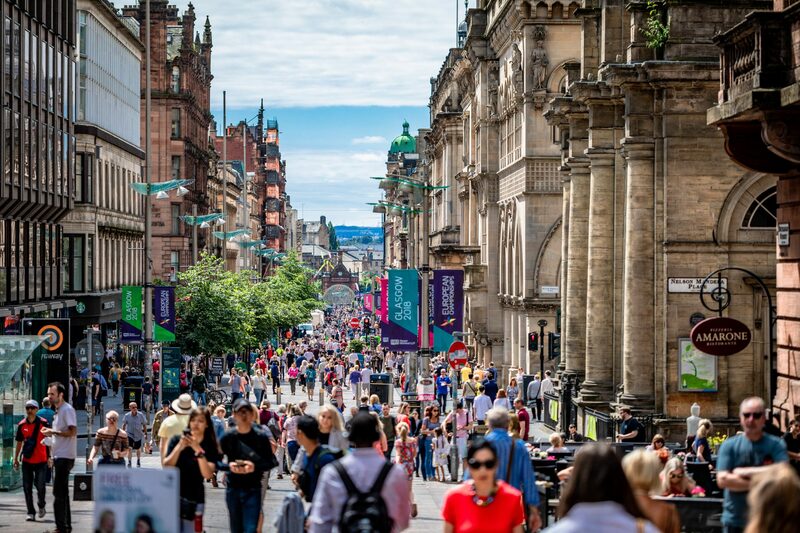 Most of our guests arrive in the city centre, either by train or from the airport, so give yourself a few moments to take in the atmosphere of Buchanan Street, one of the UK’s longest shopping streets in the UK! If you’re feeling peckish, throw yourself into the British way with a fish supper at Chippy Doon the Lane – a lovely little spot just off the main thoroughfare. Now it’s time to dump the bags and take a load off. The Acorn Hotel can be reached easily by bus or taxi, and is less than one mile from the city centre – if you’re feeling adventurous, you could even walk! Our friendly staff make the check-in process simple and are happy to give you recommendations or advice too, please just ask. One of the most efficient ways to see the city is by taking a sightseeing tour aboard one of the regular buses departing from locations throughout Glasgow. You’ll see all the major landmarks, the Cathedral, West End and River Clyde area. You’ll also hear a fascinating commentary on board, giving you an insight into our history and culture along the way. Remember that discount vouchers can often be secured by reception staff at the Acorn Hotel, so make sure you collect these before you buy. Head back to home – our three-star residence – for a nice hot shower and some downtime. Get your glad rags on and venture into the city for a night to remember. We’d recommend starting in Finnieston with dinner and drinks at Crabshakk for high-quality seafood. Then, if you like music and gigs, try Box, a grungy venue with live music seven nights a week. If cocktails and opulent surroundings are more your thing, hail a cab into the city centre for an evening at Rogana Oyster Bar. As well as serving fishy dishes, staff at Rogano really know how to craft a cocktail. When you’ve had your fill, dance the night away at One Up. With club classics playing all night and a light -up dance floor, there’s no better end to your Saturday! Sunday is a day of rest, after all. A full Scottish breakfast awaits you in the Acorn Hotel dining room, all ready to set you up right for the rest of the day. Saturday was full of adventure so today, you need to put relaxation at the top of your list. Pure Spa is just a short bus or taxi ride from our door and comes highly recommended, with a range of affordable yet luxurious treatments on offer – we’ve got our eye on the Aromatherapy massage! We reckon that’s about enough to be getting on with for just 48 hours in one of the UK’s most exciting cities, but if you have other ideas, just let us know – we’re full to the brim with local knowledge and love to pass it on!